Tooth whitening (or bleaching) is a simple, non-invasive dental treatment used to change the color of natural tooth enamel and is an ideal way to enhance the beauty and brightness of your smile. 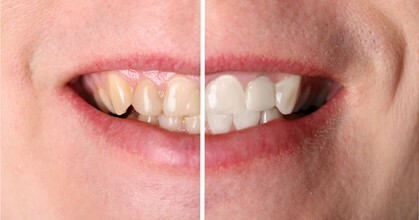 Having whiter teeth has now become the number one esthetic concern of most patients. There are a number of ways to do this procedure. Tooth whitening is not permanent. To keep the same level of whiteness it is recommended to revisit the whitening with a touch-up. The frequency of this will depend on if you smoke, drink coffee, tea, or wine. Fluorosis (excessive fluoridation while teeth are developing). Normal wear of outer enamel tooth layer. This type of tooth whitening usually requires two visits. During the first appointment, impressions (molds) will be made of your teeth to fabricate custom clear plastic trays. At your second appointment, you will try on the trays for proper fit, and any adjustments will be made. The trays are worn with special whitening solution either twice a day for 30 minutes or overnight for a couple of weeks depending on the degree of staining and desired level of whitening. It is normal to experience some tooth sensitivity during the time you are whitening your teeth, but this will subside shortly after you have stopped bleaching your teeth.